Annual grain crops such as corn, sunflowers, buckwheat, millet, wheat, and grain sorghum can provide food for wildlife in late fall, winter, and early spring. This chapter explains how to plan and design effective grain plots, how to choose sites and prepare them for seeding, and how to plant and manage them for maximum benefit to wildlife. Many landowners mistakenly believe that grain plots provide everything that wildlife need. On the contrary, small plantings of grain are the last part of the habitat puzzle because all wildlife also need water, cover, and space to survive. Unless quality secure cover is available next to the grain plot, it could become hunting grounds for predators, especially in winter. In addition, another type of food needs to be available during the spring, summer, and early fall. Another myth is that grain crops need only be planted and then can be forgotten. Fertilizer and weed control are also necessary for success of most grain crops. Deer consume grain crops more than any other wildlife species. Unless you want to attract deer, arrange grain plots away from woods, swamps and other deer cover, or plant the crop so that it is perpendicular--and not parallel--to the deer habitat. On the other hand, plots of grain can be used successfully to lure wildlife from a more valuable crop. Some farmers, for example, plant buckwheat between forested areas and valuable cashcrop fields of beans. Foraging deer eat the buckwheat and have less impact on the beans. To be suitable for wildlife, food must be nourishing, readily available, and near cover. A grain crop such as corn that stands above the snow is especially valuable in winter. Although nutritional needs and preferences of different species change season by season, winter is the most critical period for most wildlife. For example, a pheasant will eat an average of 4 ounces of corn daily for a total of 23 pounds over 90 days. A deer will eat 6 pounds of corn daily for a total of 540 pounds over the same period. Because grains are an annual crop, their value to wildlife is generally one year. However, if allowed to lie idle a second year, the decaying grain stalks and weeds that grow will help attract insects, which supply valuable protein to young-of-the-year pheasants, songbirds, quail and wild turkeys. The idle fields also offer protective cover. The most effective grain crops are located next to these idled, weedy fields. Careful planning can make the difference between projects that are buried by the first winter blizzard and those that will help wildlife make it through and beyond the storm. Size, location, and shape are key considerations. If grain plots are part of your management plan, allocate no more than 10 percent of your property to them. The ideal size of each plot is 1/2 acre to 1 1/2 acres. Larger plantings of 5 to 10 acres help lessen the impact of predators, but smaller sites attract less-mobile wildlife. The reason is because smaller plots can often be incorporated within or adjacent to secure winter cover, such as switchgrass, brushlands, or timber. Song-birds, for example, rarely venture to food sites more than a quarter-mile from secure winter cover. Location, therefore, is at least as important as size. Shape is also a key consideration. The most effective food plots are square or rectangular in design and at least 60 feet wide. If your property is long and narrow, a grain crop 60 feet wide by 700 feet long takes up only one acre of land. Such plantings make food readily available. Several types of grain have value to birds and mammals. Most wildlife managers put corn at the top of their priority list. Other grains, in order of their overall value, are sunflowers, buckwheat, millet, wheat, grain sorghum, and soybeans. Each food type has advantages and disadvantages. Corn, for example, stands well above snow and is available through the winter and well into spring. When planted from late April through mid-May and treated properly with fertilizer and herbicide, a field of corn should produce 100 bushels or 5,600 pounds per acre. Because it is a row crop, corn will often require weed control before or after planting. The black oil variety of sunflowers provides an outstanding source of fall food for songbirds, upland birds, mice, and other small mammals. Drought-tolerant and early maturing, the four to six feet tall plants are so highly favored that--on the negative side--little or no seeds are left when winter arrives. Also, sunflowers compete well with weeds. Broadcast or drill at the rate of 5 to 10 pounds per acre in May. A typical yield of sunflowers is 40 bushels or 2000 pounds per acre. Buckwheat needs little or no fertilizer or weed control because its roots produce its own toxins. But, it does not stand up well to snow. A good yield is 30 bushels per acre or 1500 pounds per acre. Buckwheat is able to produce a mature crop in 65 days. Thus, it can be planted as late as July 1 and produce a crop of mature seed by September 6. It is ideal for a wet site or a site prepared for another crop that was not planted because of wet weather. Millets grow 1 1/2 to 3 feet tall and do better than other grains in moist soils although they are not prime winter foods for wildlife because they do not stand up to snow. Varieties include Japanese, red proso, white proso and German foxtail. Japanese millet actually favors damp lowlands, mud flats, water courses and river bottoms. When solid-seeded, millet is usually able to compete with weeds if they are controlled before planting. Plant from mid-May to early July at 8 to 10 pounds per acre. Expect to get 30 bushels per acre. Wheat and winter barley grow best in areas of moderate moisture with cool weather for early growth and sunny, warm days when the grain is ripening. Planted in fall, winter barley and wheat becomes dormant in winter and begins to grow again in spring. Besides green browse for deer, grain be-comes available to songbirds by mid summer, and provides fall roosting sites for pheasants. Winter food and cover value are reduced when snow covers the ground. Plant from September to October at the rate of 120 pounds per acre; a good yield is 50 bushel/ acre or 3,000 pounds/acre. Grain sorghum has excellent drought resistance, grows well in hot dry conditions, and stands well in snow. Its key drawback is that it is not well-suited to Michigan, except for the extreme southern counties. Grain heads are two to four feet high, and the small seeds produced attract pheasants, quail, songbirds and deer. Like corn, grain sorghum needs about 100-120 days to mature; plant it according to the same schedule. A good yield is 70 bushels or 3,920 pounds per acre. Although "pure" stands of the above grains are easier to plant, fertilize and control weeds, certain grain mixes--especially those containing buckwheat and Japanese millet--are growing in favor among wildlife managers. Research to determine ideal combinations of grains is ongoing. Check with your county Conservation District for current information. Site conditions to consider before planting include potential weed problems, drainage, erosion potential, and soil type, depth, texture, and fertility. Plant grains on the best soils you have, avoiding dry or wet sites. Eliminate from consideration any slopes greater than six percent to avoid erosion problems. Level, fertile sites are not only easiest to manage, they will produce the greatest amount of seed and forage per acre. Your local Conservation District office will have a county soil survey map, which will include your property, and may help you decide what to plant where. Also, for more information, refer to the Crop Fields chapter in this section. Proper soil pH and fertility are necessary for the intended crop. A soil test will determine pH needs and recommend rates of nutrient application. Your county Extension office has soil-test kits available for a nominal charge and can analyze samples for you. Before planting any grain plot, the soil pH should be between 5.5 and 7.0. If lime is needed to raise the pH level, apply it in the fall before your planting season or at least three to six months before planting. 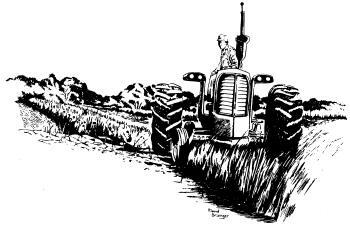 If your planting site is an old field, pasture, or was recently grass, mow it first. Use a relatively safe, broad-spectrum herbicide such as glyphosate (Roundup), at least ten days before soil work is to begin to kill all vegetation and give the grain crop a chance to compete against weeds. Be sure to read and follow label directions. If you are using conventional tillage, plow and disk the field and plant. Planting equipment includes three choices: a corn planter, grain drill, or broadcast planter. If the field is small, you may want to spread seed by hand or use a crank broadcaster. After broadcast planting, lightly disk or drag the field to barely cover the seed, or go over the field with a cultipacker or roller. If you are using conservation tillage (usually referred to as "no-till"), you can eliminate the steps of plowing, disking, and rolling. Whatever method you choose, however, row-crop grain plantings will need additional broadleaf weed control. Provide control through another application of selective herbicide and/or cultivation. Perfectly clean rows, however, are not critical because weeds do have value for wildlife--adding diversity to cover and providing protein-rich seeds such as smartweed, ragweed and millet for food. As a general rule, if weeds have taken over only 10 to 30 percent of your food plot, do not be concerned. Slightly reduced yields of 60 to 80 bushel/acre corn and 40 to 50 bushel/acre grain sorghum that result from some weed competition are still acceptable for wildlife value. Plantings of clovers and/or grasses can also provide valuable wildlife food for wildlife. For more information see the chapters in the Grassland Management section. In summary, grain plots can make a big difference toward improving your property's appeal for many wildlife species. Careful planning, attention to detail, and not expecting the plots to provide all wildlife habitat needs are key considerations. Grain plots are just one piece of the overall "puzzle".